The D*Haus Company has revealed visuals of The Arches, a row of terraced houses in London that will be characterised by rounded windows and red brick walls. When built, The Arches will replace an abandoned petrol station in the Dartmouth Park Conservation Area, and comprise six three-storey sunken houses. 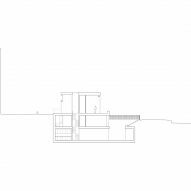 The D*Haus Company's design is informed by both the history and architecture surrounding the site as a series of previous proposals were rejected by the local council for ignoring context. "We were appointed over a year and a half ago to see if we could produce a design that met the high expectations of the residents, yet delivered the clients brief of turning this abandoned looking petrol station into a lovely place to live," said the studio's director David Ben Grunberg. "We first analysed exactly where the previous scheme went wrong," he continued. "Once we went through the planning refusal reports in detail we started to design based on all these external factors: appropriate site mass, quality of design, orientation, setting, etc." The D*Haus Company's proposal evolved from the initial idea of recreating the Victorian green lung – an area of parkland in an urban landscape – that once existed on the site. Set back from the road, The Arches aims to reconnect the two green spaces that currently flank the petrol station, and form a "clear unbroken green line" along the street that doubles as an open public space. 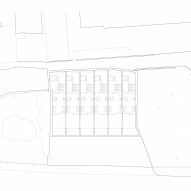 Each dwelling will then be embedded below ground level to reduce visual impact, while ensuring that light will reach the lower windows of the large housing block behind. 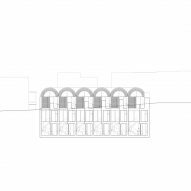 The Arches will be distinguished by arched windows and a red brick facades, designed to echo the Georgian terraces and the railways arches that surround the site. 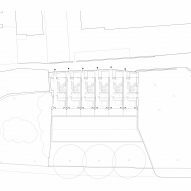 Meanwhile, their staggered forms and stepped detailing takes cues from cornicing of the neighbouring church, and entrances to each dwelling are to be positioned at the rear of the site in line with old cottages further along the street. 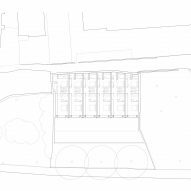 The entrances to each dwelling will lead into the top floor level, which will comprise both a study and bedroom. Below, the middle floor of each dwelling will have two further bedrooms with en suites, while the hidden ground floor will have an open plan living, kitchen and dining room that opens out into sunken patio areas. The Arches will be complete with a green roof topped by wild flowers, and bird and bat boxes will be incorporated into the facades to encourage wildlife. Founded in 2010 by David Ben Grunberg and Daniel Woolfson, The D*Haus Company is a London architecture studio. Other projects by the practice include a concept for a shape-shifting house that morphs to deal with changing seasons, and a glass extension to a Victorian house. Visuals are by AVR London.